The first 6 weeks after the treatment were tough with sleeplessness, no energy and no appetite but like magic it all subsided. I just kept encouraging him and pushing him to eat and drink and move around. Plus, RDD was available for him to talk to and order different medications to increase his energy and appetite. It almost seems like it happened eons ago because life just keeps going and family and friend needs kept us busy with their problems as well. I think one of his greatest moments when he went to his doctor in Nov. who used to prescribe him Suboxone® to tell him he went to RDD and he no longer needs to see him any longer. He wanted to keep that appointment so he could tell the doctor what he did at RDD and get his reaction. That doctor had no idea that he was going to do that. That was a great satisfaction for him! Now we are getting ready to go on vacation in about 6 weeks and this will be the first time in 8 years I believe that we do not have to worry about his Suboxone® when we travel. Now we just have to pack our clothes and NO SUBOXONE® and just go! No worries…just have fun! I would like to thank RDD for having this treatment available and for us to finally be drug free! 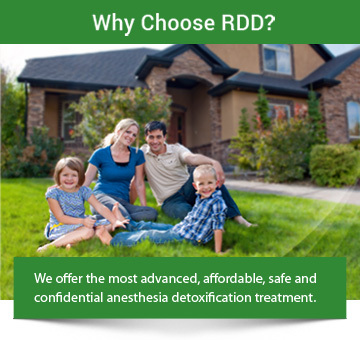 To add: it is a great feeling and blessing to me that RDD was available and in our reach to provide this great service for my husband.